A WEALTH of PORT is with us in Portland and throughout the state! 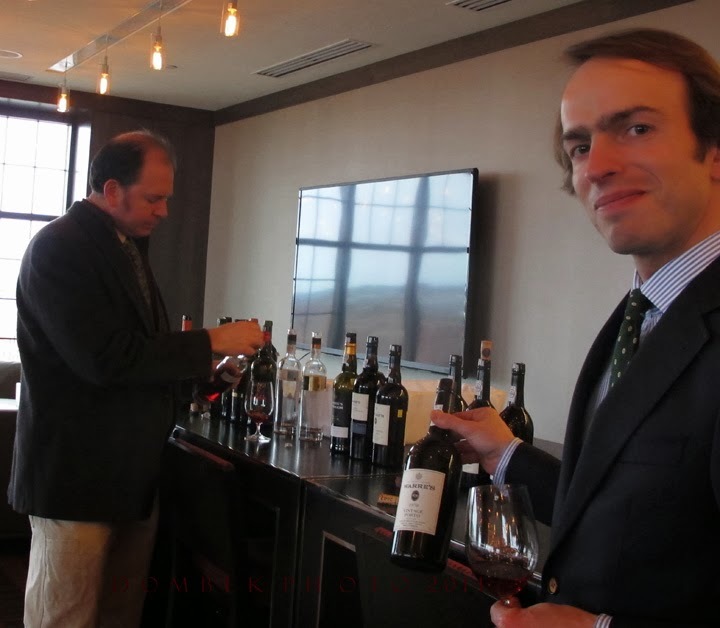 Here to remind us of that fact recently (and direct from Portugal) was Rui Ribeiro, Market Manager for Symington Family Estates, purveyor of (among others), Warre's Port, Altano wines & Madeira. Port has its origins in northern Portugal's Douro Valley, a land of rocky slopes with a terroir of schist, slate and clay, high altitudes (1400 ft) and extreme temperature shifts. These unique growing conditions and the hearty varietals that grow there create wines that are rich and concentrated; and in the hands of these winemakers, ones with much finesse and elegance. Brief company history: Warre & Co., one of the most highly esteemed port shipping firms in the world is also the oldest, established in 1670. 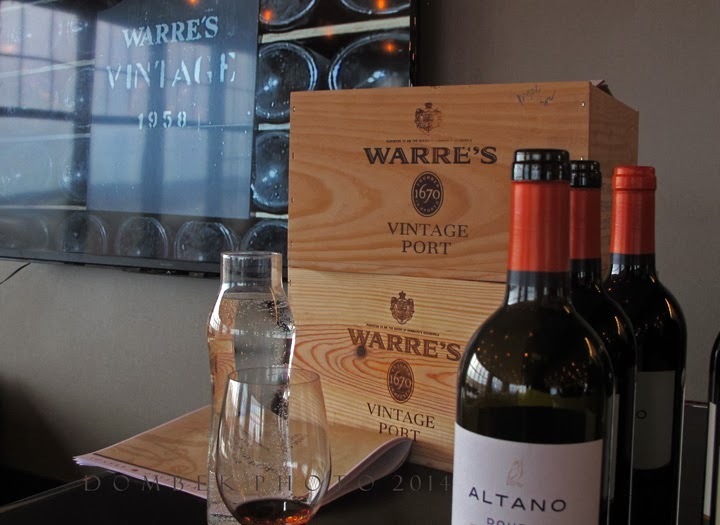 The Warre family continued working in the wine trade at Oporto for over 200 years, during which time one descendant, William Warre also became a lieutenant general, defending Portugal against Napoleon's invasion. Andrew James Symington, from Scotland and a descendant of Warre's current managing director became associated with Warre's in the early 1900's after establishing himself as a well known wine merchant in the port trade. Beatrice Atkinson, whom he married in Oporto was also descended from Port producers. The Symingtons remained in Portugal to manage operations in 1912, while the Warre's returned to England to look after sales. Hence today's Symington Family Estates. There is a lot of process going on to arrive at these beautiful fortified wines. 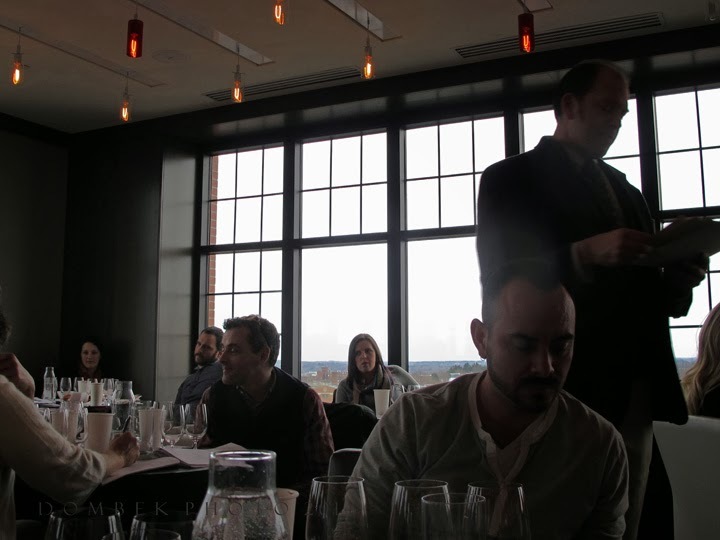 In order to set the stage and give us a feel for where the structure of Port wines come from, Rui first presented two Altano wines from the region. Made from mainly Touriga Franca and Touriga Nacional, along with Tinta Roriz and Tinta Barroca, these grapes are grown in Symington family-owned vineyards and used exclusively to make their wines, including their fine ruby, tawny and vintage ports. For illustration he points out that Touriga Franca has the soft characteristics of Merlot and Touriga Nacional that of Cabernet Sauvignon. With the Altano Douro 2011, the intention is to show the terroir of the Douro region, where they farm sustainably and in sympatico with nature. This one, a field blend, has more saturated fruit on nose with brighter, fresh cherry notes on the palate. The Altano Organic 2009 has ripe cherry on the nose with a softer mouth feel and elegant, well integrated layers of fruit & earth. This is made exclusively from their organically grown grapes, mainly Touriga Franca and Touriga Nacional. Aged 10 months in French oak. I liked this one a lot! With this we move on to the Ports! In a nutshell ... they're made in the Douro Valley and shipped to the town of Vila Nova de Gaia (a "port" town) to their vast lodges where they are bottled and stored. In Douro, grapes are allowed to ferment approximately 48 hours (just a short time to achieve such color and extraction of fruit), until the unfermented sugars in the wine arrive at the desired sweetness. A small amount of brandy (grape spirit/77% alcohol) is added at that point to block the fermentation process. Ruby ports are youthful and vibrant, arrived at by blending young wines from different vintages, then aged an average of 3 years in seasoned oak before being blended, filtered and bottled with a "T" cork, signifying it's ready to drink. Tawny ports are also made from a blend of grapes from several different vintages, but can be aged in wood for as long as 40 years and have the earthy "tawny" color. They're also ready to drink (T cork). 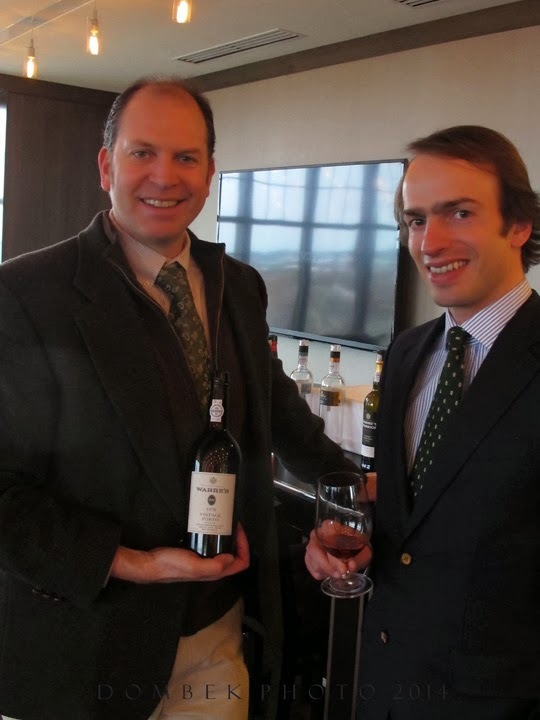 With Warre's tawnys, the profile or taste of the wines stays the same year after year, and they have a dedicated taster to make sure this is so. The blend must also retain a certain amount of young vintage to retain freshness, their signature. Vintage ports, generally most sought after, are made from grapes of a single vintage. These come from the best vintages and best sites, and in the case of a late bottled vintage port, on a declared year . A declared year is one with almost perfect growing conditions. Vintage ports are aged in wood for 2 years and remainder of aging time is in the bottle. A traditional cork is used here, signifying aging potential. Vintage ports should also be enjoyed within a few days for optimum experience. Rubys & tawnys may be kept for much longer. On to the wines ... a highlight of what was tasted! Warre's Fine White Port. An entry level white Port made with white grape varietals. This one exhibits a gorgeous golden color and dare I say retsina-like (in the finest sense) tanginess on the nose. On the palate, almonds and lightly floral. Off-dry. Lovely. In Portugal this is often enjoyed as a "Portini", a cocktail with soda & ice. I for one cannot wait to try that in my garden this summer! Rui Ribeiro (right) & Sam Brown, Pine State Beverage Co. The Heritage Ruby Port has hints of anise or black licorice on the olefactories, with more opulent, lush fruit & spice. This aged 3 yrs. in larger wood vats. I will take a moment to interject, that in addition to a broad spectrum of tastes of these fortified wines, the COLOR range was stunning. From gorgeous golden straw (white port), deep but brilliant ruby red (ruby port), earthy woody, sienna brown/reds (tawny ports), salmon color w/ rose overtones (1970 vintage port) and a powerhouse of deep dark burgundy with purple overtones (2011 vintage port). King's Tawny Port expresses itself in light caramel, nutty and honey tones and juicy fruit. Aged in smaller barrels. Recommended pairing with apple pie & vanilla ice cream! 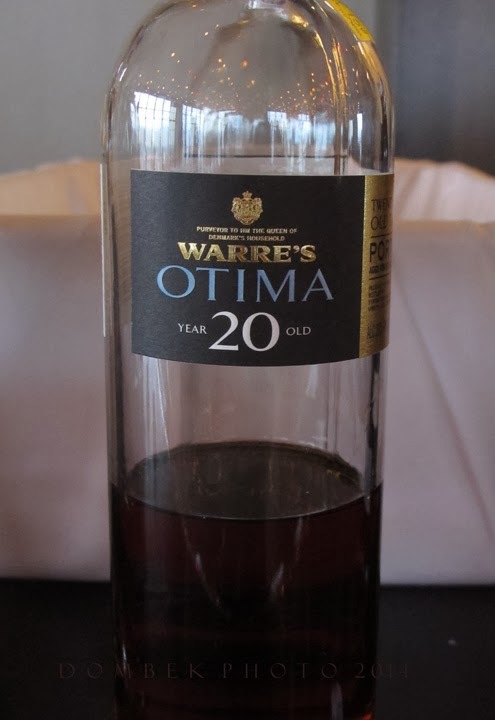 OTIMA 20 year old Tawny Port shows the sienna brown/salmon hue with whiffs of harvest green apple, along with floral, apricot, toffee and vanilla notes on the tongue. Deeper with more subtlety & complexity than the 10 year, it was also silky in texture and breathed finesse. Rui recommends serving the tawny's at cooler temps (55 degrees) to bring forward freshness, elegance and lessen the alcohol taste. The 20-yr is purported to show best the DNA of the Douro and sees a higher influence of wood. The name OTIMA or Optimum/top wine, observed to be a great tawny with a more feminine, elegant approach. 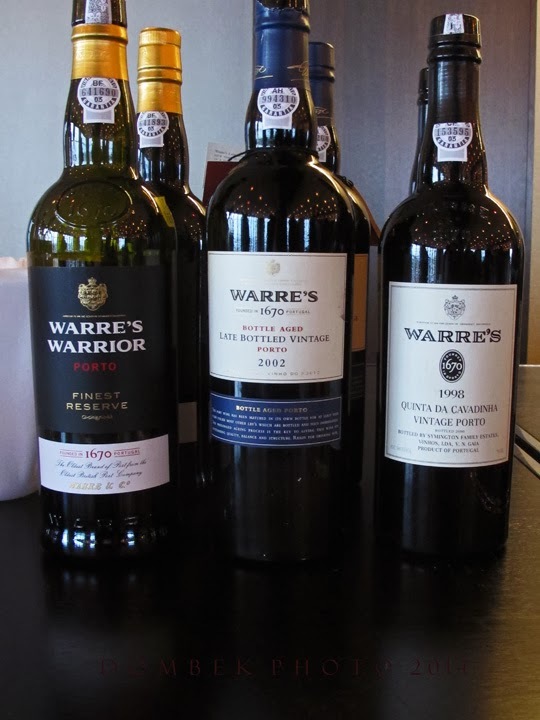 For a rich, ripe more robust experience you may want to try the Warre's Warrior Ruby Range Port. This is a reserve ruby aged 4-5 years in big vats. Velvety soft with deep ripe fruits such as dark cherry & raspberry, along with hint of green pepper & spice. Lush & rich. This port maintains a consistent profile through the years. Enjoy with CHOCOLATE. 2002 LBV Port was another of my favorites and reportedly to be of Best Value. LBV signifies late bottle vintage. This is woodier in color, with hints of fig & licorice on nose and subtler notes of rose petal, violets, plum and white pepper to taste. Luxurious fruit and mouth feel. There is an indigenous herb that grows in the Douro called the "rock rose", which definitely comes through in this wine. Aged 4-6 years in wood, then bottled, this has great potential for aging in your cellar. Unfiltered, it should be decanted through fine cheese cloth. Or ask one of your favorite restaurants if they might have it as a beautiful wine by the glass! At Top of the East/Westin - tasters pondering ! While not a declared year, the 1998 Quinta da Cavadinha Port was I felt, beautifully integrated and complex. Seriously earthy red in color with caramel & hints of woody perennials on the nose. Unique, even medicinal in quality. Blackberry fruit & cherry. Aged in wood 2 years, then bottled. 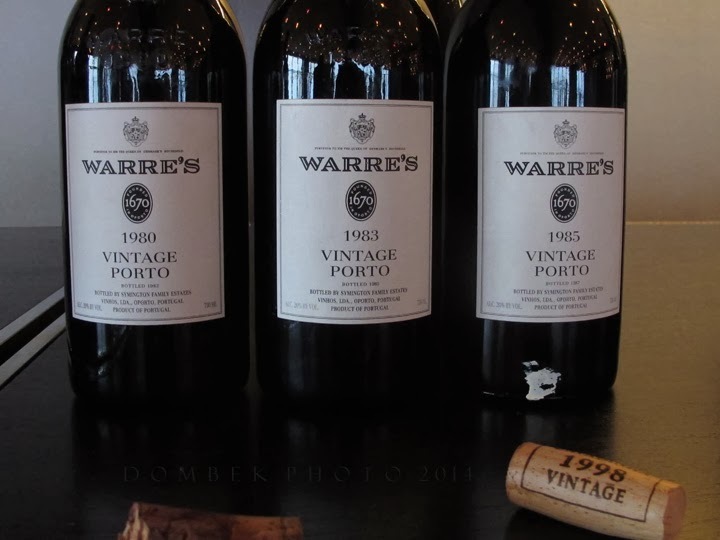 Warre's Vintage Ports/1980's: All declared years. 88 and 91 points respectively from Wine Spectator. 1980 Vintage Porto has saturated color, a rich nose of black berries, concentrated fruit like an emperor, stunning, delicious dark cherry. Resonance. Another stand-out. 1983 Vintage Porto was lighter in color with a dryer finish, lovely perfume. Concentrated berry flavors. Vintage from a warm year. 1985 Vintage Porto, ruby color with earthy overtones. Charcoal on the nose. Plum fruit. Chocolate overtones. Nicely balanced. 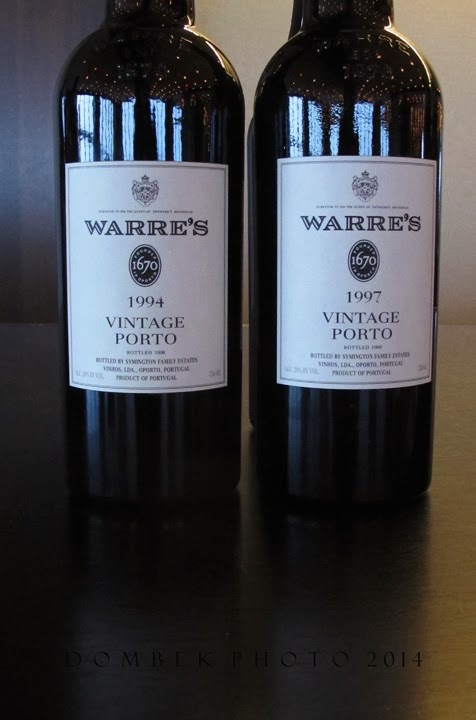 Warre's Vintage Ports/1990's: 95 and 94 points respectively from Wine Spectator. 1994 Vintage Porto was a great year for port wine and this one has great aging potential according to our host, Rui. Deep earthy in color, this exhibits brighter fruit on the nose. Vibrant! With coffee notes, viscose , rich and centered - like a gem in a great fur coat (if that makes any sense ... it's what came to mind!) Full bodied and velvety, long finish. 1997 Vintage Porto. This one is younger and expresses itself in a less complex way. A little racier. Dark ruby in color, spice. Perhaps a bit more time for this one? The last 2 pairings of vintage port tasted were the 1970 & 2011 ... what contrast! 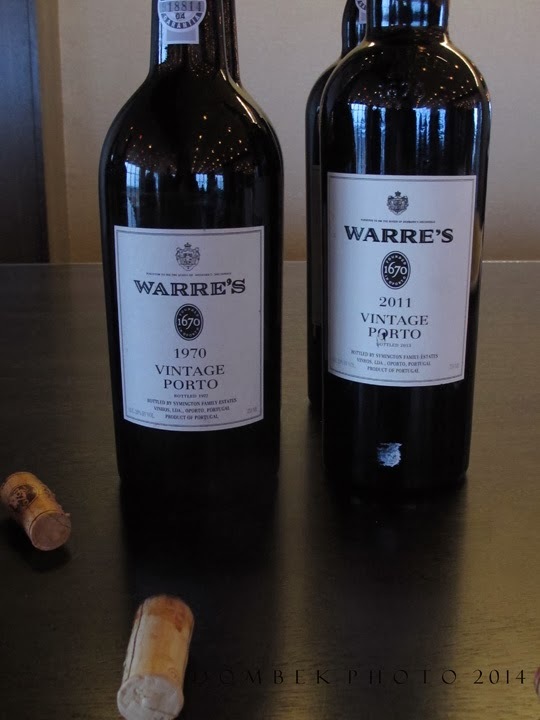 Warre's 1970 Vintage Porto. This was much more understated and I adored it for that and many other reasons ... its salmon color with rose overtones, seamless apricot fruits, cassis, finesse personified. Silky, heaven. Underlying opulence. Photo that begins article shows it in glass on the left, where the color actually appeared ligher/more delicate in person. 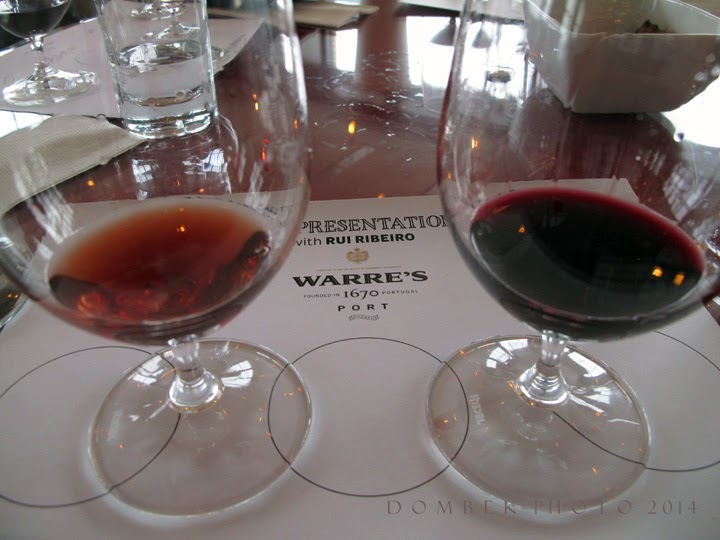 Warre's 2011 Vintage Porto. A complete powerhouse and purported to be a Best Year. Same photo shows it in glass on right. Color is deep dark regal burgundy with hues of purple. Bold flavors of dark plum, chocolate and spice waft from the glass. Intensity & structure. Recommended best from 2030 through 2060, if that says anything! These Vintage ports would make an amazing addition to ones' cellar and are available in a beautiful wooden box 6-pack case (1 each, 1970, 1980, 1983, 1985, 1994 & 1997) through the Importer, Vineyard Brands Selections and through Pine State Beverage Co. here in Maine. Ask your local retailer about this to place your order. Seek some of these out and taste for yourself!